The bulk of the 2017 growing season is still a few weeks away, but for some it’s happening now. While we wait on national crop conditions, which are likely to be published on May 30th, let’s check in areas already planting and growing, or crops already planted and growing. Our clients in the South have been blessed with normal growing conditions, and have largely avoided soaking rainfall and cool temps this spring. 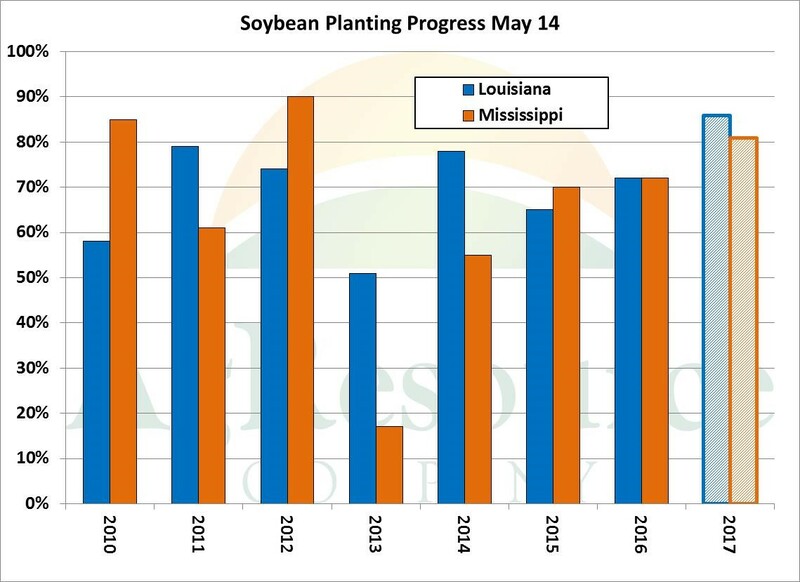 As such, soybean planting in Louisiana and Mississippi is well ahead of last year, and rivals the pace of 2012, in which weather was perfect at planting, but of course foreshadowed a crippling drought. Moisture this year, however, is adequate and the crop should enter its critical growing stage just ahead of the hottest part of summer. Southern corn, too, was planted much earlier than normal, and should pollinate in the first 2-3 weeks of June, and so pollination will occur just ahead of the hottest part of the year in TX, LA and MS. Conditions (above) already suggest the crop is much better off this year compared to last. GD/EX in LA as of this week rests at an impressive 85%, vs. 46% on this date a year ago. Tassels are already beginning to appear in parts of the state. Elsewhere, however, conditions are mixed. 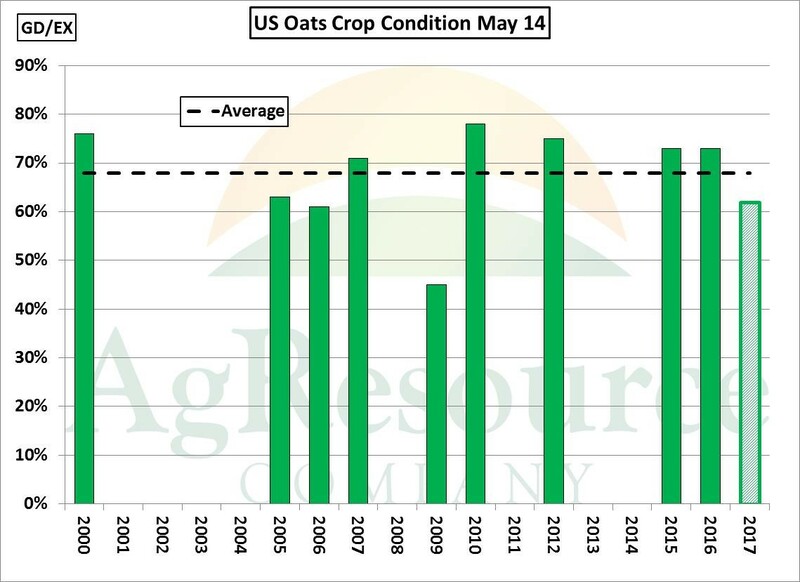 Oats condition as of May 14 is pegged at 62% GD/EX, vs. 73% a year ago, and a longer term average of 68%. Too much rain and/or too little heat has been recorded in MN, WI and the Dakotas. The season’s first corn condition rating is very likely to be below last year (like oats), but will also be underpinned by incredible conditions across the Delta & Southeast. 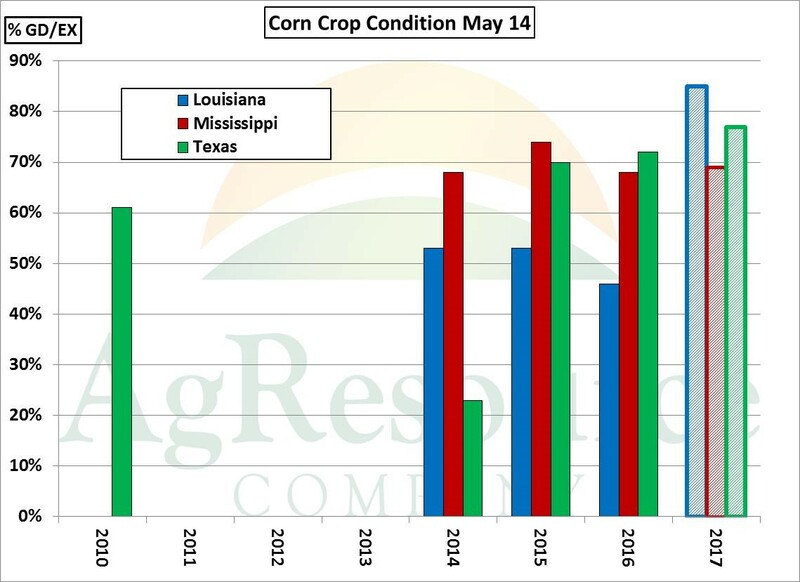 AgResource’s research has found that week crop conditions actually correlate quite well with NASS yield estimates, and so beginning in June, we’ll have benchmarks for corn yield, from which to compare as the season progresses.